Okay, so this “best film of 2010” is actually from 2009. However, I think you can still find it on the New Releases shelf at Blockbuster (or on Netflix, if you are using the free preview like we are these days). Besides, since I didn’t have the opportunity to watch it until last summer, well after it premiered at TIFF and had completed a short theatrical run, it was for me one of the best films of 2010 and definitely deserves to be seen. “Creation” (dir. Jon Amiel) is the story of the young Charles Darwin (played by Paul Bettany) – family man, budding naturalist – struggling with faith and doubt over the course of the groundbreaking research that will eventually become “The Origin of Species.” As he proceeds with his work, often in a rather morose shed full of dead pigeons, he becomes more and more aware of the implications of his research. Thomas Huxley (novelist Aldous Huxley‘s famous grandfather, played in the film by the marvelous Toby Jones) remarks exuberantly, “You’ve killed God!” But for Darwin, this sudden vision of a universe without Providence – where the only mechanism that creates and sustains life is blind chance, “what survives, survives” in a cruel succession – is a terrifying prospect. His wife Emma (Jennifer Connelly) is plunged into despair at not only her husband’s faith but her family coming apart at the seams. However, this is not just another film about science and religion, faith and doubt (“Inherit the Wind” transposed to the 19th century). It’s a film about ghosts: the spectre of an absent God, as well as the visible apparition of Darwin’s daughter Annie, who died as a child of scarlet fever. She appears and speaks to Darwin throughout the film, a constant reminder of a painful trauma that makes personal for the scientist the unfairness and cruelty of the universe. Annie’s battle with her illness, recounted in flashbacks, brings to mind Dostoevsky’s compelling words in “The Brothers Karamazov” about how the prospect of even one child suffering makes belief and trust in a caring God impossible. For such a horrible reality as the death of a child, an event that occurs with appalling regularity in the newspaper headlines, there is no appropriate theodicy. A powerful image in the film comes from the “hydrotherapy” that both Annie and Charles undergo. Darwin’s inner struggle manifests itself physically as a terrible illness, for which the questionable nineteenth-century therapy of standing under a torrent of icy-cold water is employed. This image of Darwin, and in flashback the frail, tiny figure of his daughter, being beaten down by the water represents a kind of baptism or spiritual/intellectual purification. But it is a baptism unto death (baptism is already a metaphor for death), a process meant to save that in fact kills. The ambiguity of this image in the film is deeply disturbing, but powerful as it once again materializes the immense, uncontrollable weight of a godless universe. 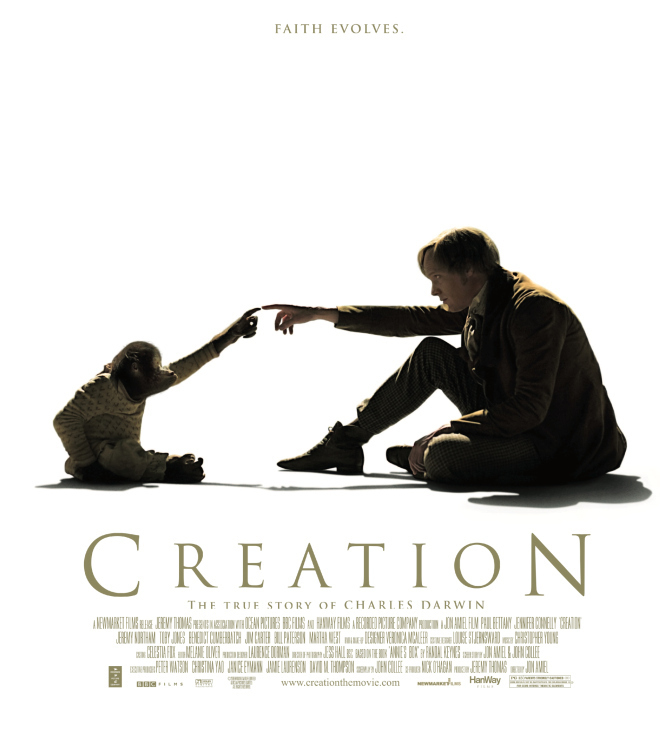 On the more positive side, “Creation” is also a film about the soul. We are shown the tragic story of an orangutan in captivity, and the bond it develops with its owner; the animal displays love, trust, relationality, intelligence, even a terrible, aching sadness. In short, it displays the divine “spark” we normally associate with only human beings. As any pet owner has experienced, animals have emotions, personalities, and so possess an inherent value as much more than commodities. This begs the question, especially in the context of a film about evolution, of how the human soul developed from prehistory to the present; what Fr. Karl Rahner called the process of “ensoulment,” the differentiation over time of the spiritual human being from more primitive ancestors. Of course, the “ensoulment” of an orangutan calls this, too, into question, as does the ubiquitous issues of Eurocentrism and the colonial mindset; the beginning of the film features two indigenous children snatched from their ‘primitive’ island home, unsuccessfully “Christianized” when brought back to England. Do the Europeans have more of a “soul” than the island-dwellers? This assumption has undergirded all sorts of misappropriations of both evolutionary biology and Christian conviction. The minister at the Darwin family’s parish clings to a Victorian “all creatures great and small / the Lord God loves them all” view of nature. Such a sentimental paradigm for the natural world, whether informed or not by a theological notion of Providence, is clearly not the goal of this film. Just as in Werner Herzog’s documentary “Grizzly Man,” we are confronted with nature in all its bewildering cruelty and complexity; sentimentality is naive, unrealistic and ultimately dangerous. “Creation” leaves us with a range of questions about the uniqueness of the human condition, about family, relationships, identity; we are left to wonder that there can be such things as beauty and love in such a hostile cosmos. 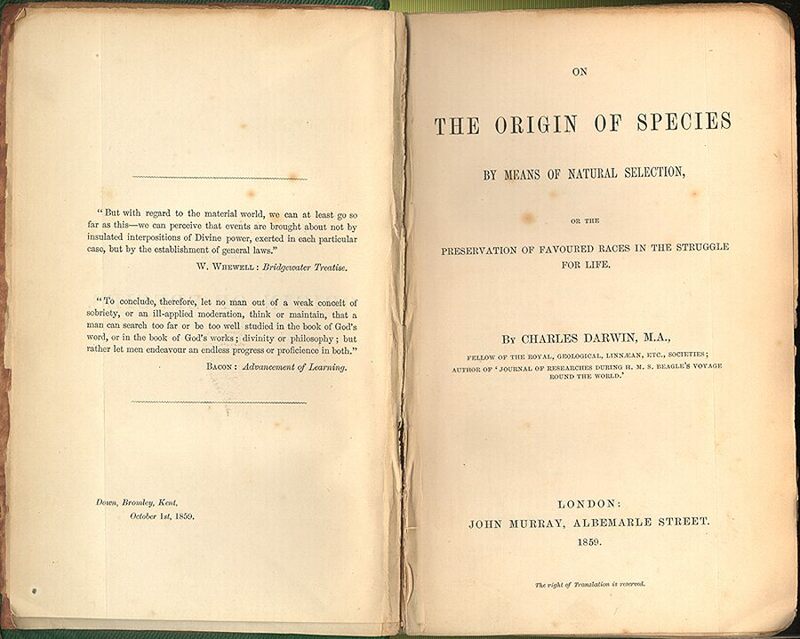 As to the question of whether or not Darwin’s faith survives, or whether special “creation” and “evolution” can coexist, we are not given the easy prospect of synthesis as in “Inherit the Wind” when ‘Henry Drummond’ (aka Clarence Darrow) picks up together in his hands a copy of “The Origin of Species” and the Bible. Instead, the problematic remains a mystery, a series of enigmas that resist being unravelled. Rahner, Karl. Hominisation : the evolutionary origin of man as a theological problem. Montreal: Palm Publishers, 1965.